It's easy and delicious to make popcorn from the kernels! Microwave popcorn is a Godsend, don't get me wrong. But if you want to avoid all the crazy chemicals, control the ingredients (I recently went gluten free, and while popcorn itself is gluten free, microwave popcorn often contains gluten), or make a delicious snack (okay… meal) for a fraction of the price, "real popcorn" is the way to go. But how do you make popcorn using just the kernels and a pan? Don't worry, it's easy! You want to cook the popcorn as hot as you can without scorching it. The hotter the pan, the faster the pop. The faster the pop, the better the pop. A slow pop will result in tough, chewy kernels that are no fun to snack on. 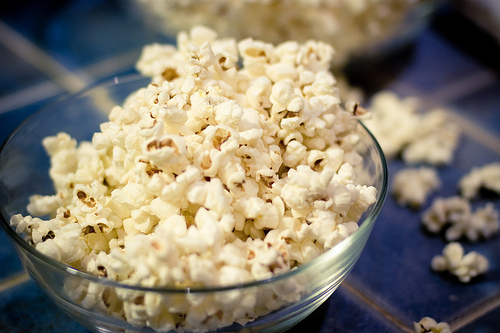 A faster pop will give you big, puffy popcorn flakes. Popcorn will pop at temperatures as low as 250 degrees. But the optimum temperature is more like 400 degrees. That's pretty hot: on most stoves, it corresponds to "medium high." Be sure your oil is hot enough before you add the kernels. Otherwise you end up with tough popcorn. Use the "three kernel method:" put three kernels of corn into the pan as you heat it up. When the three kernels pop, you're ready to dump in the rest of your kernels. You want to put a lid on your pan, to keep the popcorn from flying everywhere. But you also want to let as much steam escape as possible, because steam will make your popcorn soggy and lifeless. The best solution is to put a lid on the pan, but keep it ajar to let the steam escape. The more expensive the popcorn, the better the results. You will get far better results from a plastic jar of Orville Redenbacher kernels than you will from one of those giant four-pound bags of store brand popcorn. And you get better results still from a specialty brand like Just Poppin'. The procedure, then, is simple. Add three tablespoons of oil to the pan, and set it at medium high heat. Drop in three kernels. When your indicator kernels pop, dump in between 1/3rd and ½ cup of popcorn kernels. When the popping slows to a few seconds between pops, remove the pan from the heat. Take the lid off to let the steam escape. (The weight of the popped kernels should prevent any stray kernels from flying out.) Don't let it sit in the pan - dump it into your popcorn bowl as soon as you can. Otherwise the popcorn on the bottom may scorch, and the steam will build up and condense on your delicious kernels.